This thing shot up a two-mile-high mushroom cloud, probably the world’s first. And it was just an unbelievable cataclysm – one-fifth the power of the atomic bomb. A one-ton anchor flew four miles. A one-ton cannon flew three miles the other direction. Human beings were flown half a mile in all directions. 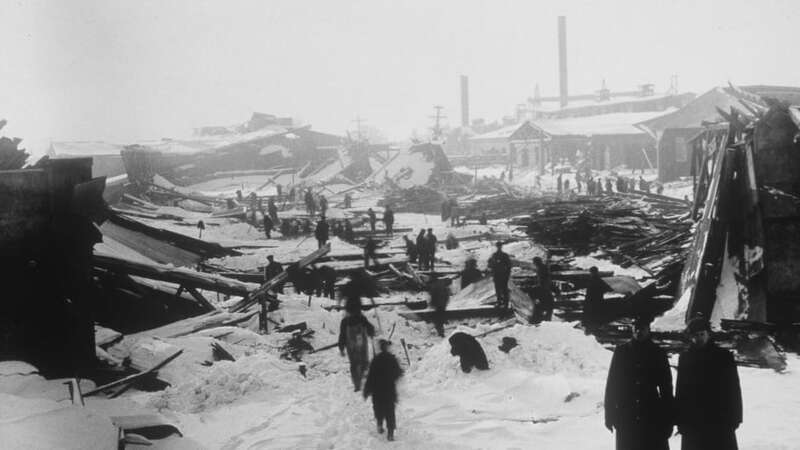 Half of Halifax is gone – 25,000 are homeless, 9,000 are wounded and 2,000 are dead in that split second. The force of the blast knocked down houses and smashed in windows, sending glass spears into the eyes of people watching the burning ship from behind windows. The explosion was followed by a tsunami that roared onto shore and then dragged victims into the harbour where they would drown. Fires broke out around the city as wood burning stoves toppled and set houses alight. The explosion wiped out 325 acres, obliterating the Richmond neighbourhood and leaving 25,000 people — almost half the city — homeless. The explosion levelled most of the city, killing 2,000 and injuring 9,000. “A reporter from the Toronto Star, who was dispatched to Halifax, reported in one of his stories that usually when he went to a disaster area, there was something to describe,” says Cuthbertson. “In this case, there was nothing to describe. It was simply acres and acres of burning wood and rubble. There was nothing to describe. The CBC article also has links to some fascinating video of witnesses. Next Post Next post: Scott Mugno: What Can We Expect After His Hearing?